You'll be ready to travel to a galaxy far, far away with this deluxe Sith robe! The adult, polyester robe has a smooth, comfortable interior and a lightly textured, realistic exterior. 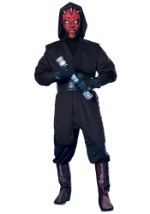 An over-sized hood and large sleeves add to the authenticity of this detailed Sith robe. Robe measures 58 1/2 inches in length. Set out for galactic adventure this Halloween season with this Star Wars accessory!